Mango seed weevil (Sternochetus mangiferae) adult, after emerging of a mango. Realsize: 8 mm long. Egg of mango seed weevil (Sternochetus mangiferae)on mango fruit. The very small egg laying scars are barely discernable at harvest. Damage by mango seed weevil. First instar larvae are elongate, cylindrical, legless and extremely slender They are 1.3-1.4 mm long. The body is white and the head is black. 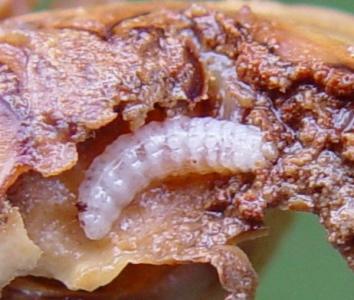 Final instar larvae are white and legless, they have a curved form, and are 1.6-1.8 cm long. (c) Peter A. Follet. Reproduced from the Crop Protection Compendium, 2005 Edition(c) CAB International, Wallingford, UK, 2005. Adults of the mango seed weevil (Sternochetus mangiferae) have a compact body and they are about 7 to 9 mm long. (c) Georg Goergen/IITA Insect Museum, Cotonou, Benin. Reproduced from the Crop Protection Compendium, 2005 Edition(c) CAB International, Wallingford, UK, 2005. Mango seed weevil close-up, after emerging from an infested mango. It is 8 mm long. The mango seed weevil is one of major pests of mangoes in East Africa. The larva, which is the damaging stage of the pest, enters the fruit burrowing through the flesh into the seeds, where they feed until pupation, destroying the seed. Early attack (when the fruits are forming) leads to premature fruit fall. 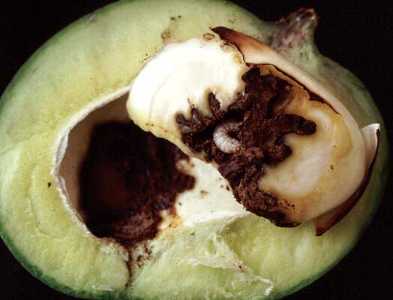 If the attacks occur at a later stage, fruit infestation is very difficult to detect, since there are no external signs of infestation, except for an inconspicuous egg-laying scar, and consequent feeding activity in the seed remains undetected. 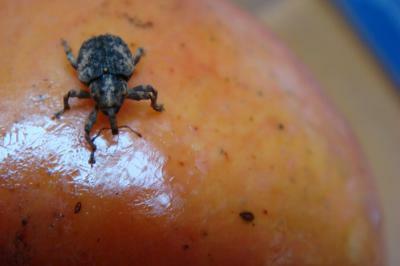 Weevils leave the fruit after it has fallen and decayed or when the fruit is ripe. Thus, yield is usually not significantly affected. When the adult emerges, it tunnels through the flesh into the open, leaving a hole in the fruit skin. In late-maturing varieties, it causes post-harvest damage to the pulp as the tunnel turns hard making the fruit unmarketable. This hole also serves as an entry point for secondary fungal infection. Mango seed weevil is a quarantine pest. Probably its greatest significance as a pest is to interfere with the export of fruit because of quarantine restrictions imposed by importing countries and the market requirement for blemish-free fruit. 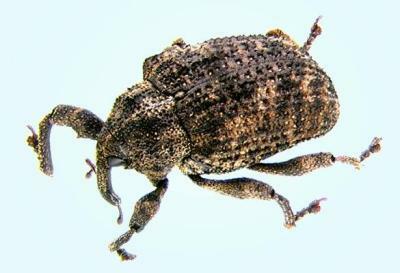 This is particularly troublesome in the case of the mango seed weevil because, in many instances, weevil attack remains undetected in the field, and is first noticed in storage or in transit. Weevil feeding reduces the germination capacity of seeds. All the evidence suggests that weevils spread into clean areas through the movement of infested fruit for propagation and consumption. 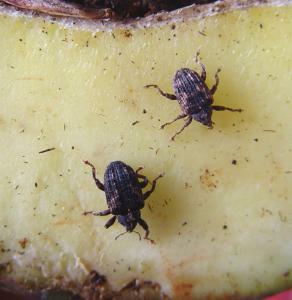 In Australia, young orchards planted from weevil-free-nursery stock have been shown to be free of seed weevil infestation for a number of years after establishment, even in areas known to have seed weevil (Pinese and Holmes 2005). Complete development of the mango seed weevil is only possible in mangoes. Infested fruits are difficult to detect to the untrained eye. The cuts made by egg-laying females are small and generally soon heal, leaving very small, dark, crescent-shaped marks on the fruit skin. Infested fruits present internal rot on the outer surface of the stone. The stones also show holes and the cotyledons turn black and become a rotten mass. 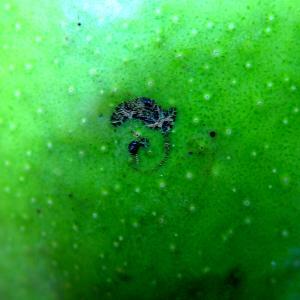 When the adult emerges a hole is visible in the fruit skin, which also serves as an entry point for secondary fungal infection. Eggs are elliptical, about 0.8 mm long and 0.3 mm wide and are creamy-white in colour when freshly laid. They are laid singly in small cavities made by the female in the skin of young fruits. There are reports that eggs may also be laid into inflorescences. The female then covers each egg with a brown exudate and cuts a very small crescent-shaped area (0.3 mm) in the fruit, near the back end of the egg. The wound creates a sap flow, which hardens and covers the egg with a protective coating. Several eggs may be laid in each fruit. Incubation requires 5 to 7 days. Larvae are white grubs with a curved body, brown heads and legless. Newly hatched larvae are extremely slender and elongated and about 1 mm long. Mature larvae are about 17 mm long. 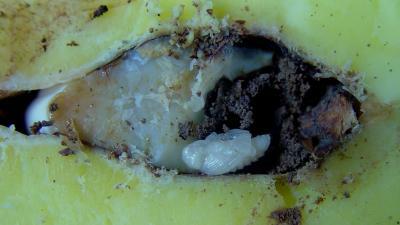 After hatching, the larva burrows through the flesh of the fruit and into the seed where they feed until pupation. The development of the larva is usually completed within the maturing seed, but also very occasionally within the flesh. Pupae are whitish when newly formed, but change to a very pale red colour just before the adult emerges. They are about 8 mm long and 7 mm wide. Pupation takes place in the seed within the stone of the fruit. Adults are weevils with a compact body, about 8 mm long. They are dark greyish-brown with paler patches. They are usually active at dusk. Adults can fly, but they are not known to be strong fliers. However, there are reports that they are able to fly longer distances than previously thought. They pretend to be dead when touched or disturbed. Adults are well camouflaged on the bark of mango tree trunks, in branch terminals, or in crevices near mango trees during non-fruiting periods. They may also live in leaf litter around the tree. During flowering the adults leave their sheltered areas and move into the canopy of the tree to feed on new growth and to mate. Females start egg laying 3 to 4 days after mating, when the fruit is about marble-size. Adult weevils feed on mango leaves, tender shoots or flower buds. They can live for two years. The total life cycle takes 40 to 50 days. This illustration shows the methods promoted on infonet-biovision. The methods shown at the top have a long-term effect, while methods shown at the bottom have a short-term effect. In organic farming systems, methods with a long-term effect are the basis of crop production and should be preference. On the other hand methods with a short-term effect should be used in emergencies only. On infonet we do not promote synthetic pesticides. Further below you find concrete preventive and curative methods against Mango seed weevils. 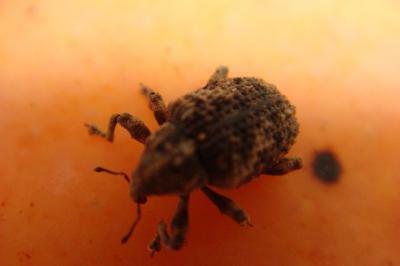 Weevil attack can be detected by monitoring for egg-laying marks on young fruit. Regular fruit scouting is important to detect adult activity during fruit growth. Good orchard sanitation is very important. Collect and destroy all scattered stones and fallen fruits. Chop them finely or bury them deeply (about 50 cm deep). Keep the tree basins clean, remove fallen fruit, seed and plant debris to prevent hiding of adult weevils. Avoid movement of fruits from areas known to have mango seed weevils to areas where young orchards, free of seed weevil, have been established. A strict policy of not bringing mango fruit into the orchard and its surroundings will greatly reduce the chance of infestation. Kok, I.B. (1979). Control of the mango seed weevil by trapping and irradiation. In: Citrus and Subtropical Fruit Journal 552, 14-16. Pinese, B., and Holmes, R. (2005). Managing mango seed weevil. Horticulture and Forestry Science Department of Primary Industries and Fisheries, The State of Queensland. Shukla R.P. and Tandon P.L. (1985). Bio-ecology and control of the mango weevil Sternochetus mangiferae (Fabricius) (Coleoptera: Curculionidae) International J. Trop. Agri. Vol 3 No 4 pp 293 -303. Shukla, R.P., Tandon, P.L., Suman, C.L. (1985). Intra-tree distribution of the eggs of mango stone weevil, Sternochetus mangiferae (Fabricius) (Coleoptera: Curculionidae). Entomology 10, 215-218. Villiers, E.A. de (1987). Mango weevil must be controlled. In: Information Bulletin, Citrus and Subtropical Fruit Research Institute, South Africa 176, 12-13.